This version of the Kershaw fillet knife is 14-1/4 inches long with enough flexible, slender fillet blade to conveniently clean larger fish. The high carbon 420J2 stainless steel of this enclosed tang knife resists corrosion but will need some extra care, especially if you fish in saltwater. Take along a good honing steel or a whetstone. The Kershaw's grip is sensibly designed without the bulkiness of some modern styles. The co-polymer handle includes enough ribbing for a secure grip, but the real security comes from the dropped heel and dropping bolster. The shape of this injection-molded grip keeps your hand from slipping to either front or back, and there's enough width for good twisting leverage. The molded design eliminates gaps which could become a sanitary issue, but the knife will need a thorough cleaning after use. 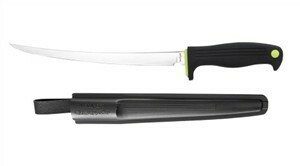 Storage may be the toughest thing a fisherman's fillet knife endures, and the hard plastic sheath supplied with the Kershaw knife is only a temporary solution. If you leave the knife in the sheath, in the bottom of your tackle box over winter, you may be disappointed when you pull it out in the spring. Clean it well before storing it in a dry location, and it should last for years. For a fine fillet knife with a traditional build, see the Amber Bone Fillet Knife from Queen Cutlery.